Fox Guest: Florida Dems Are "Manufacturing Voters" - Joe.My.God. “The forces on the left, the Democrats and their allies are trying to push this to what I call within the margin of litigation. They are manufacturing voters, and they are doing it with an architect, Superintendent Snipes, who has a record of gross incompetence and fraud. And it is a shame that she is still in this position, given the fact that through her own admission she lacks the management skills to provide an election that has integrity, and has the confidence of the voters. 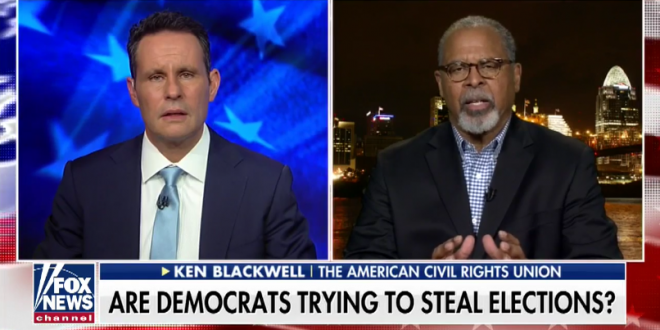 “At the end of the day, what’s going on now is akin to a banana republic and a failed state, and that’s a shame because the people of Florida, the legitimate voters who came out and voted cannot have their legitimate ballots negated by corruption, fraud, and voters who are being manufactured.” – Ken Blackwell, speaking last night on Fox News. In 2004 as Ohio’s secretary of state, Blackwell himself was embroiled in a dispute over the certification of his state’s electoral college votes, leading to the ultimately dismissed US Supreme Court case, Moss V Bush. Blackwell now works for the Family Research Council and the American Civil Rights Union, a right wing group formed in 1998 with a name intended to sow confusion with the ACLU. Blackwell has said that gays suffer from a “compulsion” that could be “restrained” if they just bothered to try.